Coach Lauzon is heading into his 6th season as a head coach and his 4th season as head coach of the Lancers. 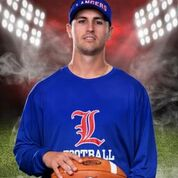 He came to Londonderry in 2014 after being an assistant coach at Saint Anselm College. Lauzon spent two seasons as the head coach for the high school in which he was a player, Manchester West. Lauzon began as an assistant coach in 2008 for the quarterbacks. He has since coached every offensive position on the field as well as special teams. Lauzon believes that coaching with great enthusiasm and effort will translate to his players. In addition to the effort and enthusiasm on the field, Lauzon also holds his players to that same expectation off the field and in the classroom. The team spends time volunteering in numerous events around the town to give back to the community that supports them. The Lancer coach has coached varsity baseball, varsity track, and middle school basketball. He believes multi-sport athletes have an advantage on single sport athletes. He encourages his football players to participate in other sports as well as offseason strength and conditioning.